If you want to make the ultimate pie for Christmas, look no further than this Cranberry Sage Pie from The Four & Twenty Blackbirds Pie Book. Not only is the filling vibrant red, but the tart and sweet cranberries and mild herbaceous sage really highlight holiday flavors in this gorgeous seasonal pie. The pie crust is perfection, super flaky with the delicious flavor of real butter. 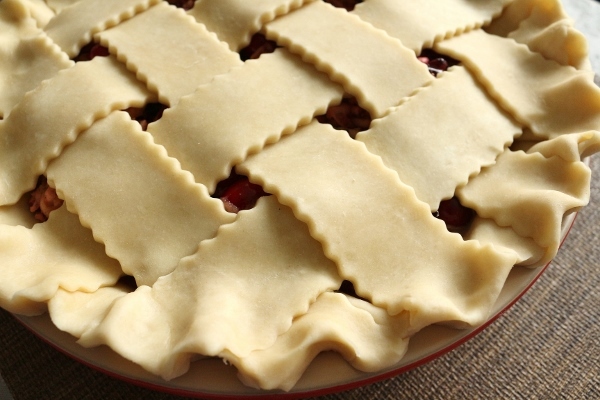 Arrange a pretty lattice or keep it simple with a standard top crust, cut with ventilation slits. A sprinkling of demerara sugar, or in my case raw sugar, adds a bit of sweetness and crunch to the golden brown crust. 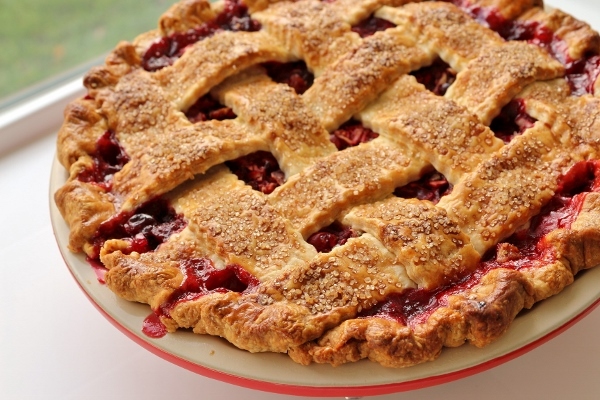 The filling contains fresh cranberries, both whole and chopped, dried cranberries that are plumped in boiling water, grated apple, a combination of sugars, starch, and some fresh sage ground right up into the sugar so its flavor adds a really mellow layer of sage flavor to the whole pie. It doesn't overwhelm, although it adds a peculiar but tasty dynamic that really allows this pie to shine. I baked this pie in my brand new Le Creuset pie dish, conveniently in the bright red Cherry color, which really is a lovely vessel for this pie. It seems extra festive, don't you think? 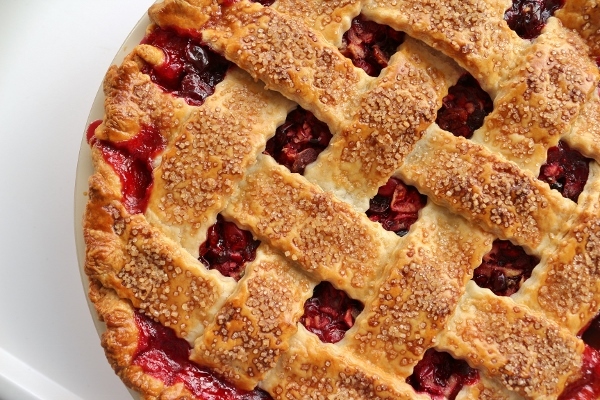 The lattice is a wonderful touch to allow diners to see the bubbly red filling leaking out of the edges, but even a classic round top with holes or slits cut into it will allow for a beautiful peek at the filling. There are so many creative ways to decorate and crimp your pies--I love trying different techniques. 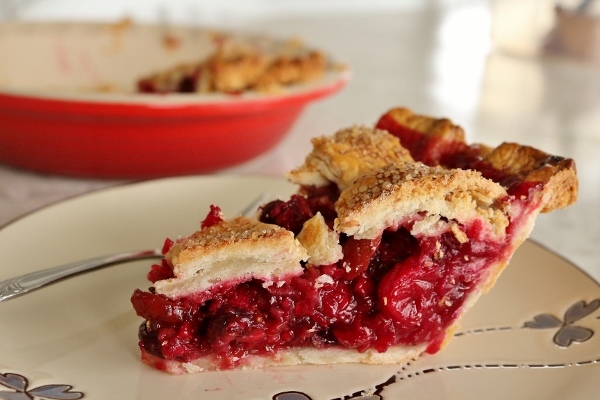 This pie is definitely one of my new favorite holiday pies! It brings the essence of cranberry sauce and sage--both often seen on the dinner table but not so much in dessert--into a whole new light. You may never look at these ingredients the same way again. 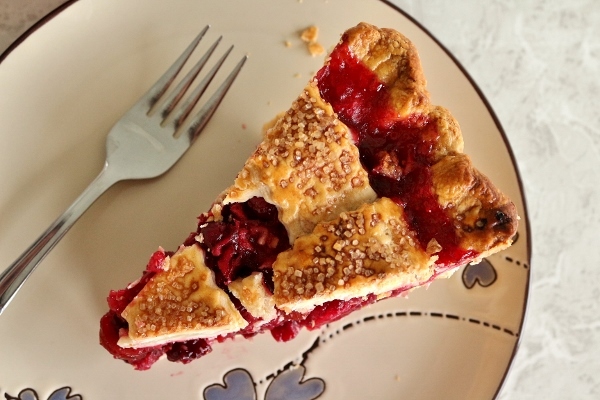 I love that this pie is more on the tart side than sweet, yet there is definitely enough sweetness in the filling and on the crust to mellow out the cranberries. It really is a perfect balance. I wouldn't change a thing. Definitely add this pie to your list for this holiday season! It would be excellent on a Christmas table, and even perfect for a ringing in the New Year. To make the crust: Stir the flour, salt, and sugar together in a large bowl. Add the butter pieces and coat with the flour mixture using a bench scraper or spatula. With a pastry blender, cut the butter into the flour mixture, working quickly until mostly pea-size pieces of butter remain (a few larger pieces are okay; be careful not to overblend). Combine the water, cider vinegar, and ice in a large measuring cup or small bowl. Sprinkle 2 tablespoons of the ice water mixture over the flour mixture, and mix and cut it in with a bench scraper or spatula until it is fully incorporated. Add more of the ice water mixture, 1 to 2 tablespoons at a time, using the bench scraper or your hands (or both) to mix until the dough comes together in a ball, with some dry bits remaining. Squeeze and pinch with your fingertips to bring all the dough together, sprinkling dry bits with more small drops of the ice water mixture, if necessary, to combine. Divide the dough in half and shape the dough into flat discs, wrap in plastic, and refrigerate for at least 1 hour, preferably overnight, to give the crust time to mellow. Wrapped tightly, the dough can be refrigerated for 3 days or frozen for 1 month. Remove the dough from the fridge 5 to 10 minutes before you being rolling. 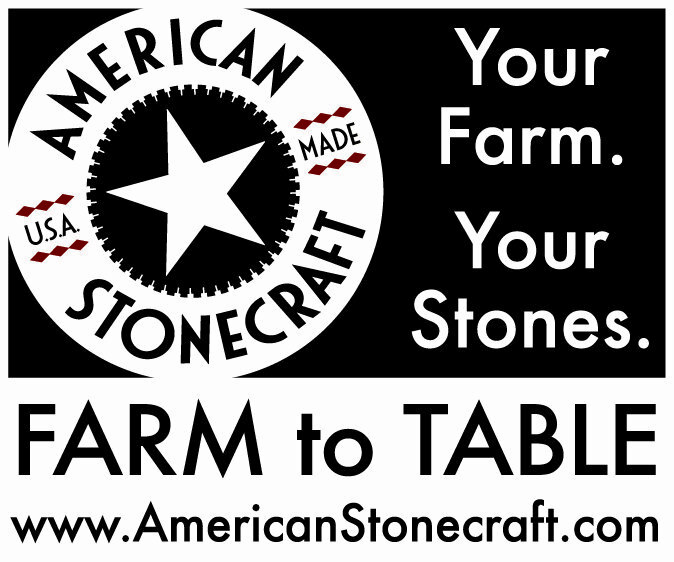 Dough that is too cold will develop cracks when it is rolled. Lightly flour your work surface and roll out one of the discs of dough until it is 2 to 3 inches larger than the pan you are using and about 1/8 inch in thickness. Fold the dough in half and lay it across one side of a well-buttered pie pan (no need to butter if you are using a ceramic pie dish), positioning the seam in the center. Unfold the disc and gently slide and fit the dough down into the pan; do not pull or stretch the dough. Make sure there are no gaps between the dough and the pan; if there are air bubbles, burst them with a fork. Trim the dough overhang to allow 1 to 1 1/2 inches of excess, measuring from the inner rim of the pan. Cover the crust with plastic and refrigerate for at least 30 minutes, preferably 1 hour or more, and tightly wrapped, up to 3 days before using. The rolled out, fitted, tightly wrapped crust can also be frozen for up to a month. On a lightly floured surface, roll out the other disc of dough into a circle approximately 12 inches in diameter and about 1/8 inch thick. To cover pie with a pastry round, simply place dough round on a parchment lined pan and chill for a minimum of 30 minutes. 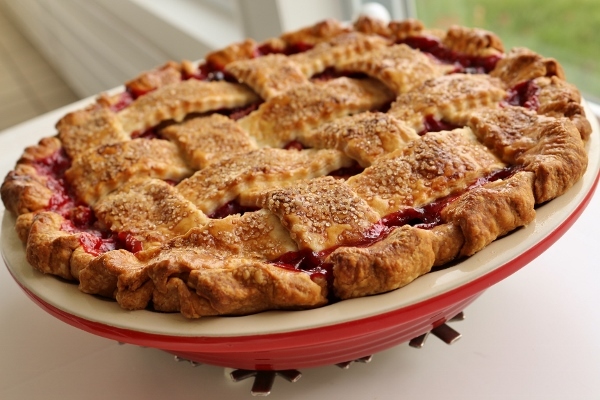 If making a lattice top, use a pizza cutter or fluted pastry wheel to trim one inch of dough from either side of the circle, and then cut the remaining shape into 8 strips of equal width (this will result in a 4-by-4 lattice--you can cut from 12 to 18 thinner strips and create a 6-by-6 or 9-by-9 lattice respectively, depending on your preference of lattice style). Transfer the lattice strips to a parchment lined pan and chill for a minimum of 30 minutes. 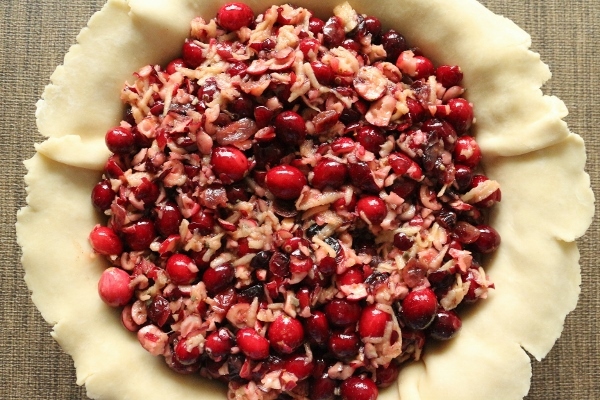 To make the filling: In a heatproof bowl, pour boiling water over the dried cranberries to cover by about an inch. Allow them to plump while making the remaining filling. In a food processor fitted with the blade attachment, combine the chopped sage, granulated and brown sugars, salt, arrowroot, cinnamon, and allspice. Process until the sage is fully blended. Pour the sugar mixture into a large bowl. Use the same food processor bowl to briefly process 2 cups of the whole cranberries to a rough chop; add them, along with the remaining 2 cups whole cranberries, to the sugar mixture. Peel the apple and shred on the large holes of a box grater. In a colander, drain the plumped dried cranberries of excess water, but do not press or squeeze them out. Add the shredded apple and the drained dried cranberries to the bowl with the rest of the filling and mix well. Stir in the vanilla extract and egg, and mix well. 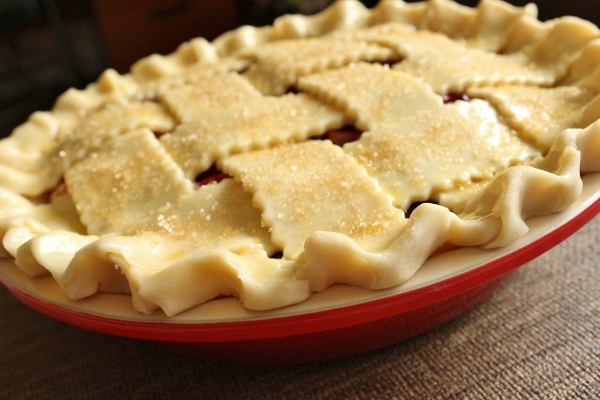 Pour the filling into the refrigerated pie shell, arrange the lattice or pastry round on top, and crimp as desired. 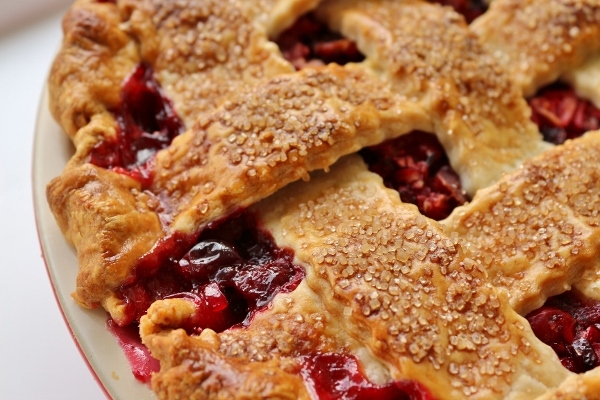 Chill the pie in the refrigerator for 10 to 15 minutes to set the pastry. Meanwhile, position the oven racks in the bottom and center positions, place a rimmed baking sheet on the bottom rack, and preheat the oven to 425° F. Brush the pastry with the egg wash to coat; if your pie has a lattice top, be careful not to drag the filling onto the pastry (it will burn). Sprinkle with the desired amount of demerara sugar. 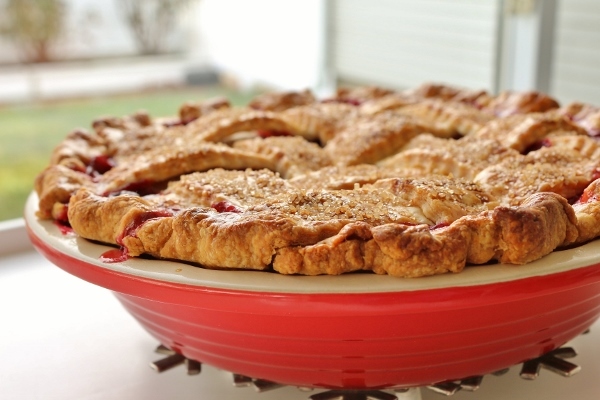 Place the pie on the rimmed baking sheet on the lowest rack of the oven. Bake for 20 to 25 minutes, or until the pastry is set and beginning to brown. Lower the oven temperature to 375° F, move the pie to the center oven rack, and continue to bake until the pastry is a deep golden brown and the juices are bubbling throughout, 35 to 45 minutes longer. Allow to cool completely on a wire rack, 2 to 3 hours. Serve slightly warm or at room temperature. The pie will keep for 3 days refrigerated or for up to 2 days at room temperature.